Pakistan’s political crisis enters its third week. The crisis that gripped Pakistan’s capital when protesters led by Pakistan Tehreek-e-Insaaf’s (PTI) Imran Khan stormed the city’s “red zone” escalated this week when Pakistani Prime Minister Nawaz Sharif chaired an emergency joint session of parliament. Both houses of parliament have convened for an emergency session that could last through the end of the week. On Tuesday, Sharif presided over the parliamentary proceedings, listening to representatives’ speeches. He is widely expected to make a formal address toward the end of the week in an attempt to defuse the current crisis. Sharif has repeatedly reiterated his commitment to remain in office despite claims by Imran Khan and Tahri ul-Qadri–a prominent cleric also leading protesters in Islamabad–that Sharif came to power through electoral fraud. The decision to convene an emergency session of parliament was precipitated by a surge in violence between Pakistani security forces and protesters in Islamabad over the weekend. Three people were killed and more than 500 others were wounded in the clashes. 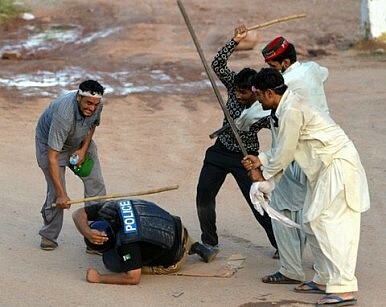 Pakistani security forces staged a heavy-handed intervention to stop the protesters from storming Sharif’s residence. The protests have increasingly grown more chaotic. On Monday, protesters managed to storm the headquarters of Pakistan’s state television broadcaster, Pakistan TV (PTV), prompting a brief broadcast blackout. This event prompted Nawaz Sharif to meet with Pakistan’s Chief of Army Staff Raheel Sharif (no relation), ostensibly to discuss the military’s next steps in attempting to maintain order in the capital. The meeting prompted some speculation that Sharif had been asked to resign. For the moment, what is clear is that the events currently unfolding in Islamabad represent Pakistan’s worst political crisis in years. What is less clear is the trajectory that this crisis could take in the coming weeks. The three sets of actors influencing events–the Sharif government, the military, and the Khan-Qadri opposition–share entirely disparate perceptions about the current state of affairs in the country. For Sharif’s government, state collapse, resignation, or a coup are simply not an option. For Khan, Qadri, and the protesters, the state has already collapsed–it’s simply a matter of evicting the current tenants of Islamabad’s red zone. The military, so far, has kept a pokerface; it even issued a statement declaring itself an “apolitical institution” with “unequivocal support for democracy.” History tells us that hasn’t always been true in Pakistan, but this crisis could prove an exception. Pakistan is experiencing its greatest domestic crisis in years. Can democracy and civilian rule prevail?